The intentions of the athletes who kneel during the anthem are anything but unpatriotic. They’re professional athletes, not political operatives, so it isn’t a surprise that the two NFL players who performed a silent protest only to see it explode into a cultural phenomenon had trouble controlling the message. It didn’t help that most Americans are happy to ignore race, and become defensive when they are forced to consider its existence. Or when the president of the United States uses the world’s biggest bullhorn to twist the protest into something it’s not. But somehow the meaning behind the NFL player protests has gotten lost in the maelstrom they set off. That’s not right. The players who have protested have been portrayed as ungrateful and unpatriotic, when their words and deeds show they are anything but. Those misconceptions are sure to arise again as the NFL starts another season this weekend, and Nike kicks off an ad campaign starring Colin Kaepernick, the first player to kneel during the national anthem. When asked, the players have been mostly respectful, and absolutely certain about what they want to say. And most have not stopped at taking a knee – collectively, they’ve donated millions of dollars and countless hours of their time to solving problems in their own communities. If nothing else, that’s a sign that they are speaking out for the right reasons, and bringing these issues forward in good faith. 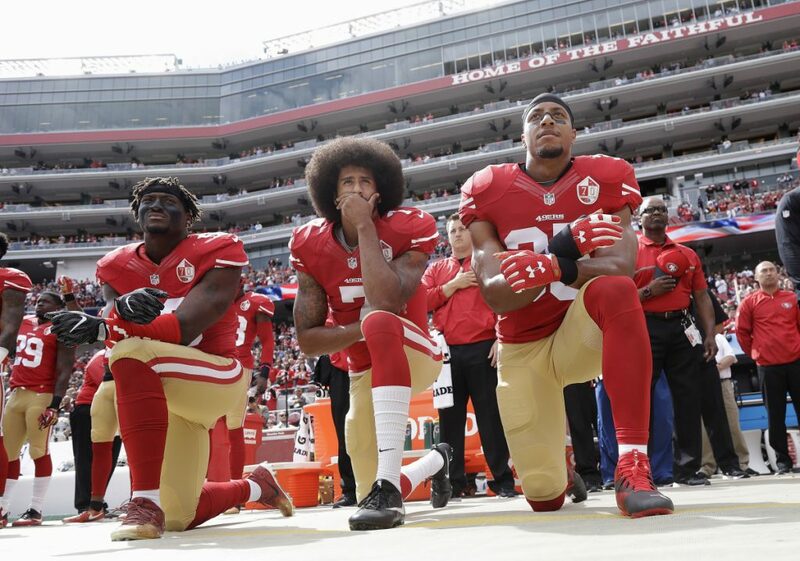 Kaepernick and Eric Reid, then his teammate on the San Francisco 49ers, were the first to protest – before a game in 2016, they sat during the national anthem. After talking it over, including a conversation with ex-NFL player and retired Green Beret Nate Boyer, they decided that kneeling would be more respectful. “I remember thinking our posture was like a flag flown at half-mast to mark a tragedy,” Reid later wrote. Those first protests, later joined by other players, were in response to police shootings the previous month of two unarmed black men, and to systemic injustices in our society. That doesn’t mean that players who stand during the national anthem support injustice. It also doesn’t mean that the ones who protest don’t appreciate the opportunities they have been given as professional athletes. It means they want to use their platform in some modest way to give voice to other black Americans who don’t have a platform. They want to draw attention to problems that many Americans never have to deal with in any meaningful way – police brutality, inequality in education and housing, overzealous incarceration. Meanwhile, the players have donated money – Kaepernick himself has given $1 million – and worked through their foundations to help disadvantaged kids, advocate for criminal justice reform and help bridge the gap between communities and law enforcement. That may not bring you to their side. But it should be enough to earn your respect.